Travertine, marble and limestone are all very similar in physical and chemical composition, so cleaning and care procedures are practically the same for all three types of stone. Let’s focus on travertine for a moment. Travertine is less dense, than granite for example, and is sensitive to acidic liquids such as wine, juice and coffee.A lot depends on the type of finish applied to the travertine. When a honed or tumbled finish is used, it is more susceptible to staining and dulling by “etching.” Because of its porosity it needs a sealer to guard against staining. 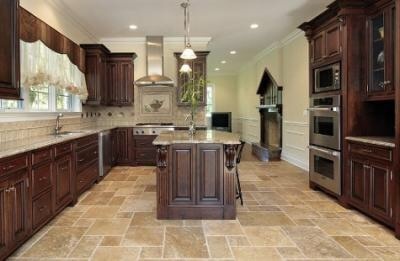 Polished travertine is practically stain-resistant. 1. Test and seal the stone — If your home has travertine installed in the bath, kitchen, dining room, etc., and it has a honed or tumbled finish, check with your designer to make sure the stone was sealed. This will help in the event of a spill of red wine, cranberry juice or another aggressive agent, especially on countertops and floors.2. Wipe-up spills immediately — The stone is sensitive to things like tomato sauce, ketchup and certain carbonated beverages. It is best to clean up quickly using hot water and a stone cleaning product. Do not use vinegar, lemon or orange cleaning agents, bleach, ammonia or store-bought products that contain acids, alkalis or other chemicals when cleaning travertine stone.3. Dust mop a travertine floor — Use a clean non-treated, dry dust mop regularly and then once a week use a wet mop with hot water and a specially formulated stone cleaning agent. It is best not to vacuum stone flooring as the machine can create chips and cracks.4. Protect and cover — Door mats and carpet runners should be used to help keep foot traffic from bringing in dirt and elements that will damage the travertine. For countertops and baths, use coasters for all drinks and decorative trays to protect the travertine from cosmetics and bath products like colognes, perfumes, oils, soaps and other toiletries. Prevention is the best remedy when it comes to maintaining travertine stone. 5. Poultices for stubborn stains — If the travertine gets stained and you can’t fix the problem through the normal cleaning procedures; a poultice may be the solution. Create a paste by combining a formulated stone cleaner with baking powder. Smooth this over the stain and cove with a clear plastic wrap. Let it stand for several days and the poultice will slowly draw the stain out. Remove the poultice with warm water and buff with a cotton cloth or chamois.6. Deep stains — In the case of a serious stain that has penetrated the stone and remains evident even after every cleaning process has been attempted, an alkaline cleaner may need to be administered. This type of cleanser can be found in most tile and stone supply stores. It should be the last resort for cleaning travertine stone.7. Ask a professional — Travertine is an excellent choice of stone for bathrooms, kitchens and dining areas and it’s luxurious appeal is a popular selling point for real estate agents. When you decide to incorporate this stone into your design plan always ask a professional the limitations and performance of this type of stone — they will also have the answers for its proper care and how to avoid damage, etching and staining.